Heath extended their winning run to eight but were made to fight all the way to secure a 21-18 win against determined visitors Dinnington. It looked plain sailing for Dave Harrison’s men, who are third in Yorkshire One, when they charged into a 15-3 lead in the first quarter. However, the South Yorkshire side hit back to lead 18-15 on 45 minutes before two Ezra Hinchliffe penalties gave victory to the relieved hosts. Fergus Marsden, Jordan Moana and Richard Brown were injured so Heath’s pack were re-organised with Seife Boussadda having a start and Ian Downsborough moving to No 8. Eddie Cartwright was unavailable so new signing Isaiah Spooner came in whilst Michael Reynolds, Max Dawes and the evergreen Mark Puttick were on the bench. Heath made the perfect start when Dinnington collected a deep kick off and found touch 30 metres out. Matt Beasty collected line out ball and Heath drove forward with captain Downsborough in charge. Alex McFadden and Boussadda added an extra surge and Peter Birkett broke off with the ball to score in the opening minute. A Hinchliffe penalty soon made it 8-0 but Dinnington re-grouped and began to apply pressure, earning three points of their own. Dan Cole put in an excellent kick to find touch. Boussadda won the ball and Birkett released Spooner. The supporting Jack Crabtree collected the ball and with still plenty to do he jinked over in the corner. A fantastic conversion from Hinchliffe opened up a 12-point lead. Dinnington were clinging on as Callum Harriett-Brown went on a run and Si Brown and Dan Cole linked well. However, the visitors surprised everyone with a breakaway try on 33 minutes and a score of 15-8 quickly became 15-11 with a penalty on the stroke of half time. There were strong words from Harrison to his charges but Dinnington were on a high and from a clever restart applied immediate pressure. They were rewarded with a converted try to lead 18-15. Heath were stunned and the visitors were playing with much more confidence but a penalty from Hinchliffe on 55 minutes levelled the scores. Reynolds and Puttick replaced Matt Beasty and Chris Moore and both made an immediate impact making strong runs. A long kick from Dan Cole did not find touch but the visitors struggled to clear and Jason Merrie and Spooner battered the defence. The pressure told as Heath were awarded a penalty which Hinchliffe converted on 70 minutes. Dinnington responded well and it became a frantic battle with Heath clinging on. As the clock wound down Olly Cook had a strong run and Si Brown and Harriett-Brown also relieved the pressure. 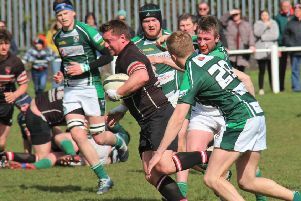 The final whistle came as a relief for the home camp who face a hard week on the training paddock ahead of Saturday’s derby at leaders Old Crossleyans.